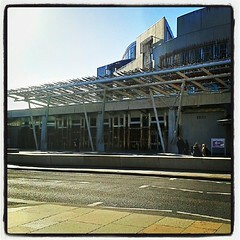 The Scottish Parliament, a photo by viralbus on Flickr. We see many headlines at the moment proclaiming that more powers for the Scottish Parliament are inevitable after a No vote. I believe many of the people saying this are sincere, and it’s true, of course, that there is an overwhelming consensus in Scotland for many more powers. A referendum offering a system whereby the UK government makes decisions about defence and foreign affairs and the Scottish Parliament decides everything else would have been won by an overwhelming majority if independence hadn’t been an option. However, if we listen to Scottish unionist politicians (for instance Gordon Brown and Ming Campbell who released their separate proposals today), they don’t agree on much. The common subset might consist of as little as devolving income tax, air passenger duty and the right of the Scottish Parliament to control its own elections. Hardly earth-shattering stuff, and much, much less than what a majority of Scots want. At this point it’s important to remember that Scottish politicians cannot decide on extended devolution on their own. Whereas a nation such as Scotland arguably has the right to seek independence at any point, changing the devolution settlement can only be done by the Westminster (and rightly so — you cannot have a club where individual members can change the rules on their own). No urgency: If the Yes side has just lost the referendum, it’ll take years before the SNP can feasibly try to call another one, so nothing bad will happen if further devolution doesn’t happen immediately. This means it won’t be urgent to do something, so it’ll be tempting simply to set up a commission and tell it to spend five years writing a report. No consensus: Whereas there is consensus in Scotland for further devolution, that is definitely not the case in Westminster. For many different reasons, there is a lot of resistance, and many politicians there would probably call for reduced devolution in some areas as well as cuts to the Barnett formula for calculating the block grant. Other priorities: Scottish independence has dominated the political debate in Scotland for the past two years, but that’s not at all the case in England, where topics such as immigration and the EU seem much more important. This means that it’ll be immensely difficult for the Scottish politicians to get their English counterparts to put anything meaty into the manifestos for the 2015 general election. In other words, more powers are definitely not inevitable. I’m sure the Scottish unionist politicians will waffle for a long time about more powers, and it’s very likely a Calman II commission will be established, but I sincerely doubt anything more significant will happen after a No vote until such a time as a second independence referendum is about to be called. More powers are very much evitable. I have more faith in the tooth fairy than I do in the likelihood that we will get any more powers – ever. I don’t agree. I think they’ll grant us some wee insignificant power that we never really wanted in the first place and tell us to shut up and be grateful.